It had looked like the session was going to face a delay, after a rare, brief rain shower hit the Qatari desert, however the rain and stopped and circuit dried in time for the session to go ahead on time. 9 time champion Valentino Rossi had led the session until ten minutes remaining when Yamaha team mate Jorge Lorenzo took the top spot from him for Marquez to then go faster than both Yamaha riders. Thursday 2nd place man Cal Crutchlow was 4th, ahead of Bradl and a consistently impressive Andrea Dovizioso, who took 6th place ahead of Dani Pedrosa. 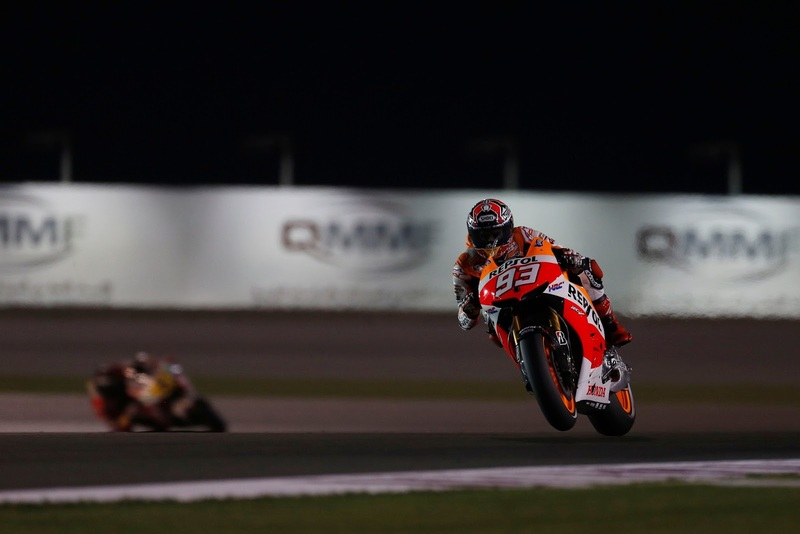 The Repsol Honda championship favourite struggling, 1.4 sec off the pace. Yesterday, the Spaniard cited corner entry problems for his slow speed but he is also having issue with a pain in his neck. Nicky Hayden put the second factory Ducati into 8th, whilst Ben Spies broke into the top 10 for the first time this season ahead of Alvaro Bautista and Britain’s Bradley Smith. Espagargo was first of the CRTs followed by PBM’s Yonny Hernandez and Hector Barbera. Irishman Michael Laverty is still last on his custom, PBM chassis CRT machine. The final practice session will commence at 18:55 BST, after which the top 10 will automatically qualify for the new 15 minute shootout for pole, whilst those placed 11 and lower will have to fight for the last 2 positions in the shoot-out in the first 15 minute qualifying session.